The most exciting game of round 10 in the National League took place in Kostanay. This derby game ended with only two-point home defeat of much higher ranked Tobol (11-7) to fourth ranked Barsy Atyrau (8-4) 96-94 on Thursday evening. 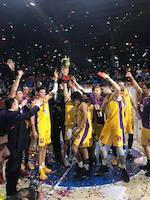 It ended at the same time the five-game winning streak of Tobol. Barsy Atyrau moved-up to third place. Tobol at the other side keeps the second position with seven games lost. Barsy Atyrau are looking forward to face Sinegorie K. (#5) in Kokshetay in the next round. Tobol will play at home against Kaspiy Aktau and is hoping to win this game. Seventh-ranked Kaspiy Aktau (1-17) gave a tough game to fifth ranked Sinegorie K. (6-8). The visitors from Kokshetay managed to secure only two-point victory 68-66. However their fans expected easier game. Sinegorie K. have a solid three-game winning streak. Newly promoted Sinegorie K. maintains fifth position with 6-8 record. Kaspiy Aktau lost fourth consecutive game. They stay dead last with 17 lost games. Sinegorie K. will play against higher ranked Barsy Atyrau (#3) at home in the next round and it may be quite challenging game. Kaspiy Aktau will play against the league's second-placed Tobol (#2) in Kostanay to get more than just one victory in their record. Very significant was Tobol's (#2, 11-7) victory against one of their biggest challengers Barsy Atyrau (8-4) 109-76. Tobol (11-7) have an impressive five-game winning streak. They maintain second position having three points less than leader Astana. Loser Barsy Atyrau dropped to the third place with four games lost. Tobol will meet at home bottom-ranked Kaspiy Aktau (#7) in the next round where they are favorite. Barsy Atyrau will play against Sinegorie K. (#5) in Kokshetay and it may be a tough game between close rivals. 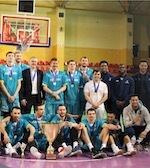 Very significant was Astana's (#1, 16-0) victory against 3rd ranked Almat.Legion (8-6) 83-58. It ended at the same time the two-game winning streak of Almat.Legion. Undefeated Astana (16-0) have an impressive 13-game winning streak. Defending champion maintains first position with a perfect record of 16 victories in a row. Newly promoted Almat.Legion dropped to the fourth place with six games lost. Astana's next round opponent will be Barsy Atyrau (#3) at home, which may be the game of the day. Very significant was Astana's (#1, 16-0) victory against 3rd ranked Almat.Legion (8-6) 90-80. It ended at the same time the two-game winning streak of Almat.Legion. Undefeated Astana (16-0) have an impressive 13-game winning streak. Defending champion maintains first position with a perfect record of 16 victories in a row. Newly promoted Almat.Legion dropped to the fourth place with six games lost. Astana will face Barsy Atyrau (#3) at home in the next round, which may be the game of the day. There were no shocking results in the other games in round 10: Barsy 2 lost to Tobol on the opponent's court 86-104. Bottom-ranked Kaspiy Aktau unfortunately lost to Sinegorie K. in a home game 60-66. Barsy 2 was rolled over Tobol on the road 60-84. Very expected game in Kostanay where 6th ranked Barsy 2 (4-12) was defeated by second ranked Tobol (11-7) 104-86 on Monday. Tobol have an impressive five-game winning streak. They maintain second position with 11-7 record having three points less than leader Astana. Barsy 2 lost seventh consecutive game. Newly promoted team keeps the sixth place with 12 games lost. Tobol will face bottom-ranked Kaspiy Aktau (#7) at home in the next round where they are favorite. Very significant was Astana's (#1, 16-0) victory against 3rd ranked Almat.Legion (8-6) 83-58. It ended at the same time the two-game winning streak of Almat.Legion. Astana (16-0) have an impressive 13-game winning streak. Defending champion maintains first position with a perfect record of 16 victories in a row. Newly promoted Almat.Legion dropped to the fourth place with six games lost. Astana's next round opponent will be Barsy Atyrau (#3) at home, which may be the game of the day. Rather predictable result when fifth ranked Sinegorie K. (6-8) defeated on the road bottom-ranked Kaspiy Aktau (1-17) 66-60 on Friday. Sinegorie K. have a solid three-game winning streak. Newly promoted Sinegorie K. maintains fifth position with 6-8 record. Kaspiy Aktau lost fourth consecutive game. They stay dead last with 17 lost games. Sinegorie K. will face higher ranked Barsy Atyrau (#3) at home in the next round and it may be quite challenging game. Kaspiy Aktau will play against the league's second-placed Tobol (#2) in Kostanay and hope to win that game. Very significant was Astana's (#1, 16-0) victory against 3rd ranked Almat.Legion (8-6) 90-80. It ended at the same time the two-game winning streak of Almat.Legion. Astana (16-0) have an impressive 13-game winning streak. Defending champion maintains first position with a perfect record of 16 victories in a row. Newly promoted Almat.Legion dropped to the fourth place with six games lost. Astana will face Barsy Atyrau (#3) at home in the next round, which may be the game of the day. Not a big story in a game in Kostanay where 6th ranked Barsy 2 (4-12) was rolled over by second ranked Tobol (11-7) 84-60 on Tuesday. Tobol have an impressive five-game winning streak. They maintain second position with 11-7 record having three points less than leader Astana. Barsy 2 lost seventh consecutive game. Newly promoted team keeps the sixth place with 12 games lost. Tobol will face bottom-ranked Kaspiy Aktau (#7) at home in the next round where they are favorite.